The HOME Network is managed by its Steering Committee that includes the Chairperson and the focus area group leads. The Steering Committee meets six times per year (via teleconference or face-to-face) to provide leadership for the HOME Network, and to review project outcomes and next steps in line with the group’s overarching vision and objectives. In addition, the full membership of the HOME Network meets face to face at two workshops held each year to further drive its agenda and outcomes for the group’s focus areas. 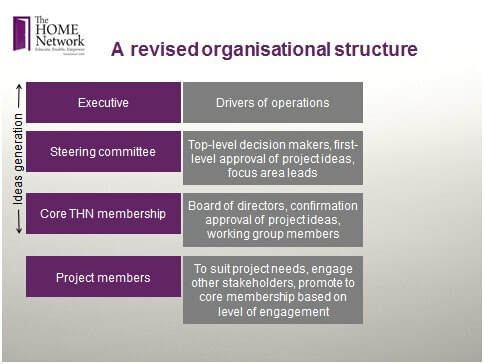 At the Annual Workshop of The HOME Network in September 2016, a new revised organisational structure (Fig. 1) was endorsed by the members. This new structure will enhance the strengthen the Network in the future development. ​Governance structures and succession plans are in place to ensure leadership roles are cycled regularly and to identify and engage new members to replace those who step down from their involvement. The strategic plan will continue to be reviewed (and revised where necessary) on an annual basis to ensure the ongoing alignment of The HOME Network with up-to-date issues associated with home dialysis and its utilisation. Focus area groups (Fig. 2) act independently of the Steering Committee to drive projects designed to address the barriers identified that inhibit optimal utilisation of home dialysis in Australia. Importantly, focus area groups remain fluid and flexible, engaging The HOME Network members and other stakeholders based on their expertise and passion, and capitalising on the resources needed to have maximum impact and influence of the HOME Network.